What strange birds, those flamingos! If they’re not happy with their home – in saltpans or other marshy areas –, if the water level is too low or it’s too hot or too cold, they simply say: “Let’s move”. Officially flamingos are not migrant birds that live here in the summer and somewhere else in the winter, but they might well change their habitat due to the weather. On Lesvos you can find two regions with saltpans (Skala Kalloni and Skala Polichnitos), where in summer and winter you may see flamingos. Where do they come from? 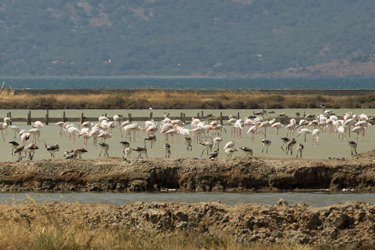 The closest place for the flamingos on Lesvos to have come from is mainland Turkey, just on the other side of the Aegean, above Izmir: the Gediz Delta, a 8000 hectare Valhalla for birds. Some 17,000 flamingos live there in the winter, laying thousands of eggs from which little grey flamingos crawl. Or could the Lesvorian flamingos come from further away, like Lake Tuz, a large salt lake just south of Ankara (Turkey). It seems to me that both Lake Tuz and the Gediz Delta are wonderful places to live for a bird which feeds on the plants and small animals that live in salt areas. Putting aside the question of where they actually come from, how do you suppose the flamingos know that, in such and such a period, life in Lesvos is better? Do you think they Face-book or twitter like: “Yeah, great water with lots of delicacy’s and nice temperatures here in Skala Polichnitos. Come!”? And there is another strange thing: when they decide to go for a long holiday (most flamingos eventually return to their birthplace), they choose their destination according to the prevailing winds of their first autumn. Studies of a group flamingos in the south of France showed that some of them went holidaying in Spain and others went to Tunisia or Turkey. So it is possible that on Lesvos you can find flamingos from the French Camargue, I mean they might think that Lesvos is the Turkish Gediz Delta. Another weird thing is that flamingos know the art of how to change food into colours. The cute pink colour they acquire is from eating algae containing carotenoid and not, as the popular story says, from eating pink shrimps (which they also eat). Just imagine if our hair became red from eating masses of carrots, or green by consuming lots of spinach, or white by eating bananas. That would be fun. As much fun as looking at a large groups of flamingos, balancing on one leg and filtering the algae, shrimps or little crayfish from the water is; to me it seems a little tiring to stand all day on one leg, especially as God gave them two legs. It is believed that this one leg acts as a cooler (dogs also cool themselves by staying on four legs in the water) and that putting two legs in the water would cause too much cooling to the body. Another theory is that should they get one leg stuck in the mud, they can use the other one to pull themselves free. In any case, it seems to me that flamingos have a carefree life, especially now that the Roman Empire is long past: a time when people hunted flamingos in order to serve them at fancy dinners. Now I understand why Lesvos was such a beloved holiday destination for the Romans: I bet plenty of stuffed flamingos or flamingo tongues were served here, both considered great delicacies in those times. As far as I know they didn’t eat the eggs, or the chicks. Flamingo chicks are not as desirable as cute yellow chicken chicks, because they’re grey and only when they get older and have eaten well do they turn into those beautiful creatures with pink feathers. When they’re about two years old their parents send them to a small crèche and later on to a larger one where thousands of other kids come. Last week we saw such a crèche in Skala Polichnitos: ugly grey toddlers who must have been on a school trip because there are rarely baby flamingos born on Lesvos. And what do you suppose they do the whole day long? They eat and they blather. Just like the storks, another bird to be seen on Lesvos. Nowadays the black stork is very popular amongst bird watchers and you can see plenty of them at the half-dried rivers around Kalloni, at the saltpans and one has even been spotted at the water reservoir of Molyvos. I am sure they gossip and who knows if the storks, who are migrating birds, try to persuade the flamingos to come with them to Africa where they spend their winters. That particular journey is not without dangers, especially when wearing scientific equipment. A few days ago a stork was arrested in Egypt because he wore a suspicious electronic device. In any case, most flamingos do not like to travel that far. And they prefer to fly overnight, so that probably means they’re not really into sightseeing. Having said that, a few weeks go a large group of flamingos arrived on Lesvos, along with the large numbers of Turks who have visited the island this summer. Does that mean that the flamingos here do come from Turkey to have an all-inclusive holiday?